Aliyah R. Khan is a native of Guyana and an Assistant Professor of Caribbean Literature in the Department of English and the Department of Afroamerican and African Studies at the University of Michigan, Ann Arbor. She is also a board member of the Arab and Muslim American Studies Program at the University of Michigan. She holds an M.F.A. in Fiction Writing from Hunter College of the City University of New York, and a Ph.D. in Literature and Feminist Studies from the University of California, Santa Cruz. 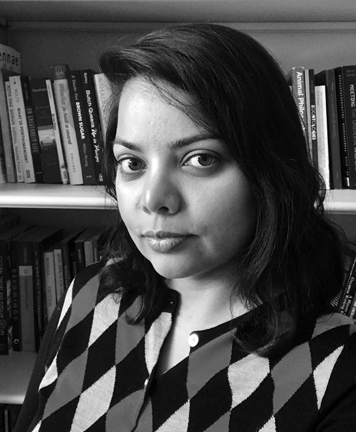 Her current research areas are postcolonial Caribbean literature, and contemporary Muslim and Islamic literatures, with emphases on race, gender, and sexuality. Khan’s academic and nonacademic writing appears elsewhere in venues including GLQ, Studies in Canadian Literature/Études en littérature canadienne, The Rumpus, and Agents of Ishq. She is currently working on a book on 19th-21st-century literary representations of Islam and Muslims in the Anglophone Caribbean and Suriname, during and after the transatlantic African slave trade and Indian plantation indentureship.